Hyperthermia treatment of cancer by high temperatures? PITTSBURGH - March 13, 2017 - PRLog -- . Hyperthermia cancer treatment is based on high temperatures from heat produced in exposing magnetic iron-oxide NPs to an alternating magnetic field . NPs stand for nanoparticles. Classical heat transfer suggests there should not be any advantage to placing the NPs in the cell as the surface temperature of a NP should be close to that of its surroundings. However, magnetic heating is known to be far more effective in killing cancer cells than hyperthermia using a hot water bath. One explanation  for this disparity is magnetically heated NPs have significantly higher surface temperatures. To confirm this, the NPs were coated with a temperature sensitive fluorescent polymer and placed in 20 ºC water. When the water was externally heated, the fluorescence intensity was not observed until temperatures reached 35 °C. However, upon heating the NPs in a magnetic field, the fluorescence intensity was observed to increase immediately with the water at 20 °C. Hence, the magnetic heating of the NP was concluded to have higher surface temperature than that of the water, thereby explaining the greater effectiveness of magnetic heating in killing cancer cells. Upon heating a magnetic NP, the Planck law of QM precludes any increase in NP temperature, let alone surface temperature, because the heat capacity of the NP atoms vanishes under high EM confinement, the latter a consequence of the high surface-to-volume ratios that confines the heat absorbed from the magnetic field to the NP surface. QM stands for quantum mechanics and EM for electromagnetic. 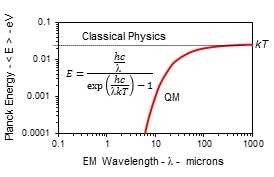 The Planck law of QM at 300 K giving the average energy <E> of the atom or heat capacity as a function of the EM confinement wavelength λ is shown in the thumbnail. Classical physics always allows the atom to have heat capacity from the macroscale > 1000 microns to the nanoscale < 0.1 microns. QM differs by only allowing the atom to have heat capacity for λ > 100 microns, otherwise the atom has diminished heat capacity. NPs of nanoscale dimensions with EM confinement wavelengths λ < 0.1 microns have vanishing heat capacity. Cancer necrosis from magnetically heated NPs does not occur by high temperatures, but rather by QED induced EM radiation at UV levels or beyond. UV stands for the ultraviolet.The EM radiation created with Planck energy E inside the NP excites all lower NP quantum states by flourescence, e.g., the iron-oxide NPs in  having d = 52 nm and n = 2.9 creates EM radiation having E = 4.1 eV at λ = 300 nm which is in the UV-B known to induce necrosis by precluding DNA reproduction of cancer cells. Today, not only are temperatures thought [2, 3] to exist in NPs, but UCNPs are used as nanothermometers to measure temperatures in cancer cells. UCNPs stand for up-conversion NPs. Up-conversion is complex photochemistry relying on speculative multi-photon processes. In contrast, simple QED directly excites all lower NP quantum states by fluorescence. UCNP nanothermometers  assume fluorescence occurs by temperature, but QM precludes any increase in temperature. Instead, conservation of NIR heat in 18 nm NaYF4 UCNPs having n = 1.49 proceeds by simple QED inducing the creation of EM radiation with E = 23 eV at λ = 54 nm that by fluorescence directly excites the lower NaYF4 states in the VIS at 520 and 540 nm. Nanothermometers  comprising both 5 or 20 nm paramagnetic NPs and temperature sensitive 49 nm long and 23 nm wide NaYF4 UCNPs are encapuslated in 80 nm silica NPs . The magnetic field heats the 5 or 20 nm paramagnetic NPs while the NIR at 980 nm heats the entire silica NP including the UCNPs. Without magnetic heating, the NIR alone heats the silica NP. For silica having n = 1.35, simple QED produces EM radiation E = 5.75 eV at λ = 216 nm that by fluorescence directly excites the 520 and 540 nm VIS states of the NaYF4 UCNPs. With magnetic heating, the same VIS states of the UCNPs are excited, but because of the additional heat the VIS spectra have higher intensity. Cancer treatment by magnetically heated NPs does not occur by hyperthermia, but rather by QED induced EM radiation in the UV and beyond. The calibration of UCNP emissions with bulk temperature from 25 to 100 °C has no meaning as QM precludes NPs from having temperature which is an artifact of classical physics. UCNP nanothermometers in cancer cells are not measuring temperature, but rather simple QED induced EM radiation beyond the UV raising the question of whether UCNPs in cancer treatment are justified considering the UV may create new cancer cells by damaging the DNA of bystander cells. L. Polo-Corrrales and C. Rinaldi, "Monitoring iron oxide nanoparticle surface temperature in an alternating magnetic field using thermoresponsive fluorescent polymers, J. App. Phys. 111, 07B334 , 2012. F. Vetrone, et al., "Temperature Sensing Using Fluorescent Nanothermometers ACS Nano 4, 3254–3258, 2010. J. Dong and J. I. Zink, "Taking the Temperature of the Interiors of Magnetically Heated Nanoparticles", ACS Nano, 8 , 5199–5207 , 2014.